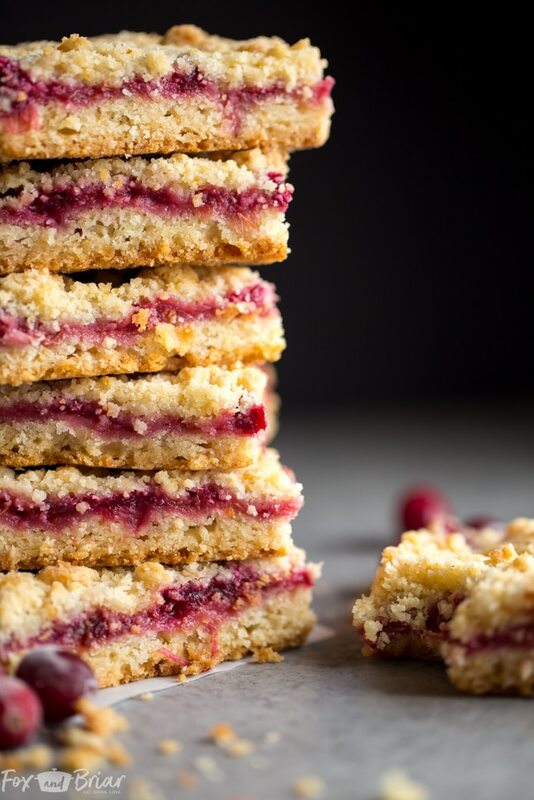 These Leftover Cranberry Sauce Crumble Bars are a sweet and tangy treat that you can make the day after Thanksgiving. They are a great way to use Thanksgiving leftovers, but are so good that I would make a new batch of cranberry sauce just so I can make them again! Happy almost Thanksgiving! Thanksgiving is great, but if you are like me, by Friday you are asking yourself “What can I make with these Thanksgiving Leftovers?”. I mean, the day after Thanksgiving turkey sandwich is great and all, but it can get old. Don’t worry, I have a TON of leftover recipes for you, including these Leftover Cranberry Sauce Crumble Bars! If you have more leftovers, check out my Citrus Kale Salad ( a lighter way to use up turkey), cranberry sauce muffins, and a whole roundup I did last year of creative ways to use up your leftovers. Oh, and if you had ham instead of turkey, these super easy Ham and Cheese Croissants are a great way to use up leftover ham! These Leftover Cranberry Sauce Crumble Bars are so easy! It just takes a few minutes so stir together the dough. Then you press half of the dough into a pan, top with cranberry sauce, and crumble the rest of the dough on top. Pop in the oven and you are done! These make a great treat, the tangy cranberry sauce balances the buttery crumble crust. And they totally work for breakfast too, just saying. Preheat the oven to 375 degrees. Grease a 9×13 inch pan. In a medium bowl, stir together 1 cup sugar, 3 cups flour, baking powder, salt, and orange zest. Use a fork or pastry cutter to blend in the butter and egg. You can also use a food processor. Pulse ingredients together until just combined. Dough will be crumbly. Pat half of dough into the prepared pan. Spread the cranberry sauce over the first layer. Crumble the rest of the dough on top. Bake for 45-55 minutes, or until top is slightly brown. Cool completely before cutting into squares. If you don't have enough cranberry sauce, making a new batch is easy! Try my recipe HERE. If you make this recipe don’t forget to tag it @foxandbriar and #foxandbriar on instagram and facebook! I really love to see what you make! I just made these and they turned out great. They look exactly like your pictures. I wanted to add a streusel-like topping so I saved the last 1/2 cup or so, added a pat more of butter, few tbs of brown sugar, a dash of cinnamon, and a small handful of quick oats. Also, I omitted the orange because I used orange in my sauce. I usually made Martha Stewart’s cranberry upside cake but this is my new recipe for leftover cranberry sauce. I’m now wondering how I can get creative with the fillings! Thank you so much for sharing your great recipe! Hi Jill! Yay! I’m so happy to hear that you loved them. Thanks for your comment! These are a simply amazing idea – especially as a) I never know what to do with leftover cranberry sauce past turkey sandwiches so it is always getting thrown out, and b) I make my cranberry sauce with a dash of cherry brandy (http://www.rachelphipps.com/2014/12/christmas-kitchen-cranberry-sauce-with.html) and I bet that would be fabulous in a bar! bookmarked this for next year (I’m a brit so turkey is a christmas thing, but we’re not going traditional this year because the kitchen is undergoing renovation!) – and happy thanksgiving! also, i made the aubergine stuffed lamb for dinner the other week and it was utterly amazing – so easy to do, and my boyfriend was requesting it again before we had even finished eating!